Introduction: We were invited to famous lake El Salto in Mexico by Shimano to field test their brand new pre-release reels and rods before ICAST. 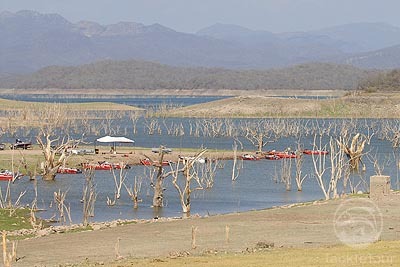 El Salto is on the short list of top bass lakes in the world, and it seemed like a fitting location to see if the latest crop of Shimano reels and rods was truly ready for their upcoming debut at ICAST. Getting the call: We talk to Shimano on a regular basis, always trying to get the inside scoop on tackle from their Product Managers. Three months ago Zander received an email from Jeremy Sweet, Product Manager of Reels, at Shimano. On the email there were only three words �Call me, ASAP� followed by Jeremy�s cell number. 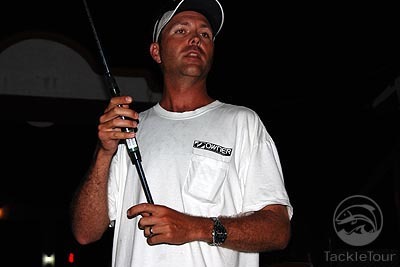 When we called Jeremy asked us if we would have time in June to field test some of their new reels and rods prior to ICAST, to which Zander responded �sure thing, we can come down to Southern California.� There was a pause, and Jeremy said �that�s why I thought it was better we do this on the phone, get your passport ready, were going to El Salto.� What followed was a whole lot of hollering in our office. About El Salto: El Salto is one of those lakes that are truly made of legend, and certainly a top fishing destination for all Bass Anglers. It certainly was on our �wish list� (the list of places I absolutely must fish, before I can no longer wind them in). We were not sure if the reports over the years were exaggerated, but pictures from anglers returning to the US after excursions south of the border were enough to make any largemouth angler foam at the mouth. Combine that with the opportunity to not only preview the new pre-release Shimano reels and rods, but also fish them for four days, we felt like we just hit the lottery. 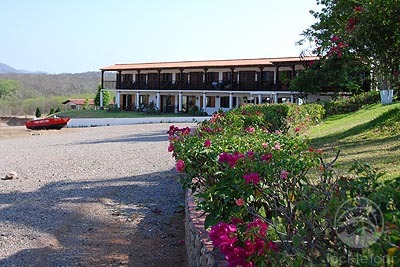 Flying in: One of the reasons why El Salto is so popular to begin with is its geographical location in relation to the United States. On a plane it is simply a hop and a skip away from both coasts. 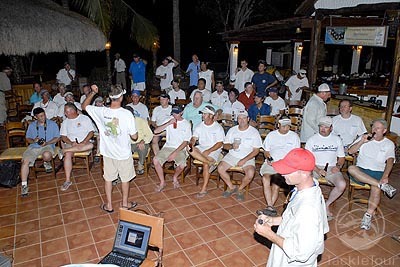 Shimano flew in a number of their key dealers from all over the country in for the event, and on average with one connection there was less than five hours of actual flying time. Not bad for an �exotic� fishing destination. 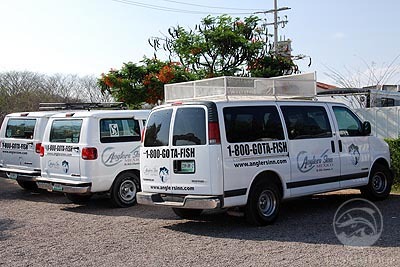 Most anglers traveling to El Salto will stop in either Phoenix or Houston before hopping on the final plane into Mazatlan, the nearest city to the lake. Once arriving at Mazatlan the lake is about an hour and a half by car into the mountains. Lucky for us we were greeted at the airport by a representative from Anglers Inn, the fishing lodge that would serve as home base for our field tests. We were then shuttled an hour and a half to the lodge. The Anglers Inn: That hour and a half from the airport to El Salto felt like the longest 90 minutes in our lives, as we were eager to get a look at the new tackle, and pit it against some big bass. When we arrived at the Anglers Inn we were immediately greeted with nachos and margaritas, the event sure was starting out right. What we discovered at the Anglers Inn was a far cry from the fishing lodges we were used to. 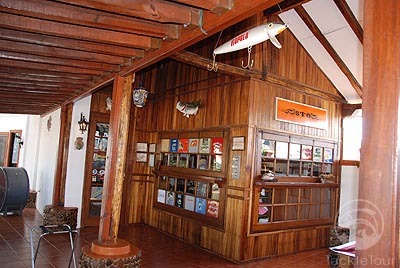 This is a full service facility with excellent air conditioned rooms, a full service bar, covered dining area, tackle shop, and even cable TV! 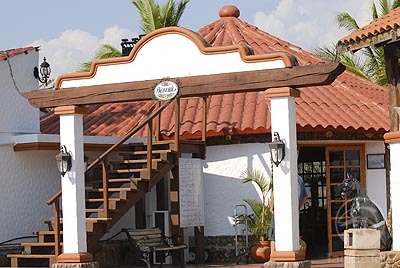 We certainly didn�t rough it at El Salto and the service was outstanding. The fishing schedule at the Anglers Inn is broken up into two parts, wake up at 5AM and fish till lunch at which time there is a siesta until 3:30pm when we got back on the water and fished until the sun went down. The siestas were so good that we started thinking we needed to start implementing them into all our field tests. The Team from Shimano: Once we got situated at the lodge we were met with just about all the key players at Shimano America, and even the design engineers for reels and rods from Japan. They were eager to get us on the water and to see what we thought of their new products. 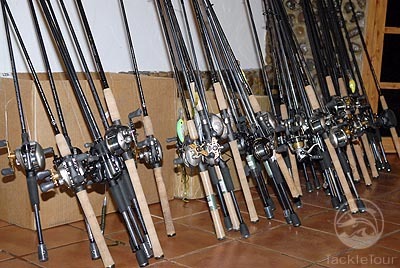 They explained that we would be fishing with two brand new reels, three redesigned reels, and a brand new line of rods. They went on to say that this new lineup was just a sampling of what they had in store for ICAST just two weeks away. Shimano brought plenty of rods and reels for the beta test, so much in fact that the "Federales" actually detained the team!